HOW to predict the weather correctly by means of astrology depends upon the ability of the predictor rightly to discern the parallels between the inner-plane weather and the outer-plane weather. The condition of the inner-plane weather, and therefore the condition of the outer-plane weather, is influenced in general by the signs occupied by the planets and the aspects made between them, and by the houses occupied by the planets in some particular area. Every movement of a planet into a new sign, every aspect made between planets, and every marked change of motion made by a planet, produces a corresponding effect upon the weather of the earth. When planets occupy signs which are harmonious to themselves, such as when they are in their exaltation or in their home sign—the sign they rule—and make favorable aspects with each other, the earth in general experiences advantageous weather. But when planets occupy signs which are discordant to themselves, such as when in their fall or detriment—the sign opposite the one they rule—we may be sure that the weather will respond and be unseasonable. Furthermore, whenever the planets in the sky make oppositions, squares, T-squares and grand squares (crosses) which are fairly close to perfect, this inner-plane violence is quite certain to manifest also in weather on the earth. Where this violence, or high or low temperature, or wind or calm, or dryness or wetness will occur on the earth, as indicated by the positions of the planets in the sky, is determined by the house positions of the planets in the three weather charts. 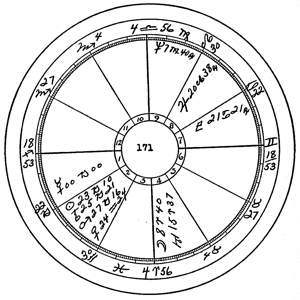 The date when the peculiarities of the weather indicated by the positions of the planets in the sky and their house positions will manifest most pronouncedly is indicated by the date on which an outstanding transit progressed aspect is made to the degree on the Ascendant of the weather chart. The Temperature Chart indicates not merely the temperature for the three month season it covers, but the general tendency of both wind and moisture also. But it does not indicate the dates on which there will be marked changes in wind velocity or moisture precipitation. Yet on or near the date when some planet makes a perfect aspect to its Ascendant, the temperature will change within the limits indicated by the chart as a whole according to the character of the planet making the aspect and the nature of the aspect. Limited by the wind shown for the Temperature Chart of the season, the Air Movement Chart indicates the general trend of air movement during the period Mercury is in the sign entered. It does not indicate changes in either temperature or moisture precipitation. But when some planet makes a perfect aspect to its Ascendant, the air movement will change within the limits indicated by the chart as a whole according to the character of the planet making the aspect and the nature of the aspect. Limited by the moisture shown by the Temperature Chart of the season, the Moisture Chart indicates the general trend of rainfall during the following month. It does not indicate changes in either temperature or air movement. But when some planet makes a perfect aspect to its Ascendant, there will or will not be rain at that date within the limits indicated by the chart as a whole according to the character of the planet making the aspect and the nature of the aspect. 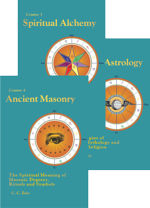 Even as in natal astrology, horary astrology, mundane astrology and stellar diagnosis, an aspect which is within one degree of perfect at the time the chart was erected is considered as having the power of a progressed aspect. 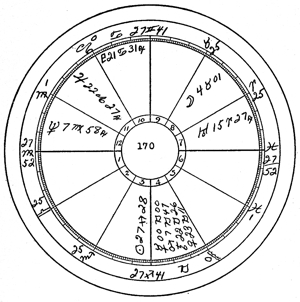 And as in a weather chart the sensitive point is the Ascendant, an aspect at the time the chart was erected within one degree of perfect to the Ascendant is a powerful progressed aspect tending to concentrate the weather indicated by the planetary aspects in the sky and their house positions at the place where the chart was erected. Such a progressed aspect to the Ascendant at the time any weather chart is erected tends to give unusual activity to the weather at that place. This does not of necessity indicate a storm. But it does indicate that the temperature changes, the wind, or the precipitation of moisture—according to whether it is a Temperature Chart, an Air Movement Chart, or a Moisture Chart—at that place during the period covered, will be more pronounced than otherwise, and especially during the time the progressed aspect is within the one degree of effective orb. If the chart as a whole indicates advantageous weather, the temperature change, wind or rain thus indicated during the period will be favorable. But if the chart is violent, and the aspect to the Ascendant, whether harmonious or discordant, connects up through tying in to it by aspect with some opposition, square, T-square or grand square, it tends to make more certain that the violent weather indicated by the chart will manifest in full fury at that place; provided, of course, that violence is shown in the houses influencing the weather in that locality. Any aspect in the sky which is within the one effective degree of perfect has the force of a progressed aspect. But where this force will manifest depends upon house positions. If violence is indicated in the general area, a planet making an aspect within one degree of perfect to the Ascendant at the time the chart is erected acts as an aerial. And even if this aspect is a sextile or a trine, if the other aspects are violent and powerful, it may act as a means by which the Rallying Forces of the heavy discordant aspects reach the Ascendant and manifest the violence in that region. Rallying Forces are not confined in their activity to natal astrology and stellar diagnosis. They are equally effective in horary astrology, mundane astrology and weather predicting. Therefore, it must not be assumed that merely because the progressed aspect to the Ascendant on a given date is harmonious, when the chart as a whole shows violence, that the weather will be fine. We may be sure that violent aspects between planets in the sky will be coincident with violent weather on the earth, and that the violence will be characteristic of the planets involved in the aspect, but of a type that occurs in the given locality. Whatever the aspect, it will not manifest as a hurricane in the Rocky Mountains, but possibly as a cloudburst and flood, because hurricanes do not happen there. Nor will it be a tornado in California, but some form of destructive weather such as at times there occurs. The heavier planets, by their aspect with each other, are more productive of such violent weather because their aspects, due to slow motion, are more enduring. Jupiter, however, because it is the planet of fine, warm, sunshiny weather, is less potent in this respect, even when afflicted by other planets. Each of the planets, of course, has typical weather characteristic of it, and influences the weather in this direction. The fourth house of any weather chart or mundane chart is the house having chief rule over the weather. Experience, however, shows that while the fourth house is the most important single factor in weather judging, that there are also three other factors of importance. And experience shows just about how much relative importance to place upon each of these four factors. THE FOURTH HOUSE: We find that one-half of the total weather influence of any one of the three types of weather charts should be judged from the fourth house. In this, the most important factor is any planet which is actually in the fourth. The sign it is in and the aspects it makes are first to be considered. Then, as second in importance, comes the sign on the cusp of the fourth. And finally, the planet ruling the sign on the cusp of the fourth, the sign it is in and the aspects it makes, should be considered. THE FIRST HOUSE: We find that one-fourth of the total weather influence of any one of the three types of weather charts should be judged from the first house. Any planet in the first house and the aspects it makes are most important. Then, as second in importance, the sign on the cusp of the first should be considered. And finally, the planet ruling the sign on the cusp of the first, the sign it is in and the aspects it makes, should be considered. THE PLANET FOR WHICH THE CHART IS ERECTED: We find that one-eighth of the total weather influence of any one of the three types of weather charts should be judged from the planet for which the chart is erected. In a Temperature Chart the sign in which the planet ruling the sign the Sun is in should be given consideration. Thus if the Sun has just entered Aries, the sign Mars is in influences the weather. In an Air Movement Chart the sign in which the planet ruling the sign Mercury is in should be given consideration. Thus if Mercury has just entered Libra, the sign that Venus is in indicates this influence over the wind. In a Moisture Chart the sign in which the planet ruling the sign the Moon is in should be given consideration. Thus if the Moon is in Capricorn in a Moisture Chart, the sign Saturn is in is the most important factor in so far as this one-eighth influence on the weather is concerned. PLANETS IN ANGLES: As the final consideration of the four factors, we find that one-eighth of the total influence of any one of the three types of weather charts should be judged by the planets in angular houses. If in a Temperature Chart they are predominantly hot in nature, it tends toward hot weather. If in an Air Movement Chart the planets in angles are mostly windy, this influences toward wind. If in a Moisture Chart the planets in angles are wet, rain may be expected in so far as this one-eighth influence is concerned. When, in reading the Temperature Chart and the Moisture Chart in the manner above indicated it is found that the damp and wet planets and signs, and particularly the dour Capricorn and the morose Saturn, have considerable influence—even when not enough to bring actual rain—we may look for dark, cloudy and gloomy weather. Moon, Saturn and Venus tend to considerable wetness and clouds. Pluto and Neptune, while less wet, also are able to obscure the Sun. In a wet chart Pluto, unless violently afflicted, in which case he brings disastrous storms, tends to drizzle, and Neptune tends toward fog. In general, then, these five planets tend toward dark days. Mercury tends to blow clouds away. Uranus, if prominent enough, may bring gusts of wind and thundershowers, but does not tend to permanent cloudiness. The Sun, Mars and Jupiter tend toward clear, bright weather, unless they are so heavily afflicted as to influence a violent storm. Their storm influence, however, is of temporary duration, and is followed by clear weather. So, in general, it may be considered that there are five planets which tend to give a fairly bright sky. Storms, as a rule, coincide with marked temperature changes, with wind, and with precipitation of moisture. Therefore, when all three weather charts show violence at a particular place, the storm signals are apparent. But it is hazardous to try to predict storms from only one of the three charts. Instead, all three should be considered, and when much violence is shown, a departure should be made from the general rule, and even wind indications in the Moisture Chart and rain indications in the Air Movement Chart should be weighed, together with indications of electrical disturbances. That is, before predicting a heavy storm, it should be shown in all three weather charts for the time when it is expected. 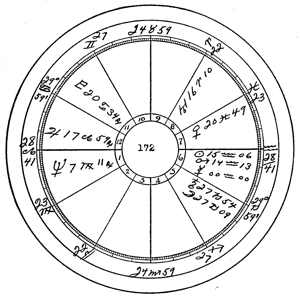 As the effectiveness of the planets and signs in indicating weather depends upon their individual characteristics, it is essential that their characteristics in relation to the weather be thoroughly understood. Each planet and each sign has a definite influence upon the temperature, upon the movement of air, and upon moisture. 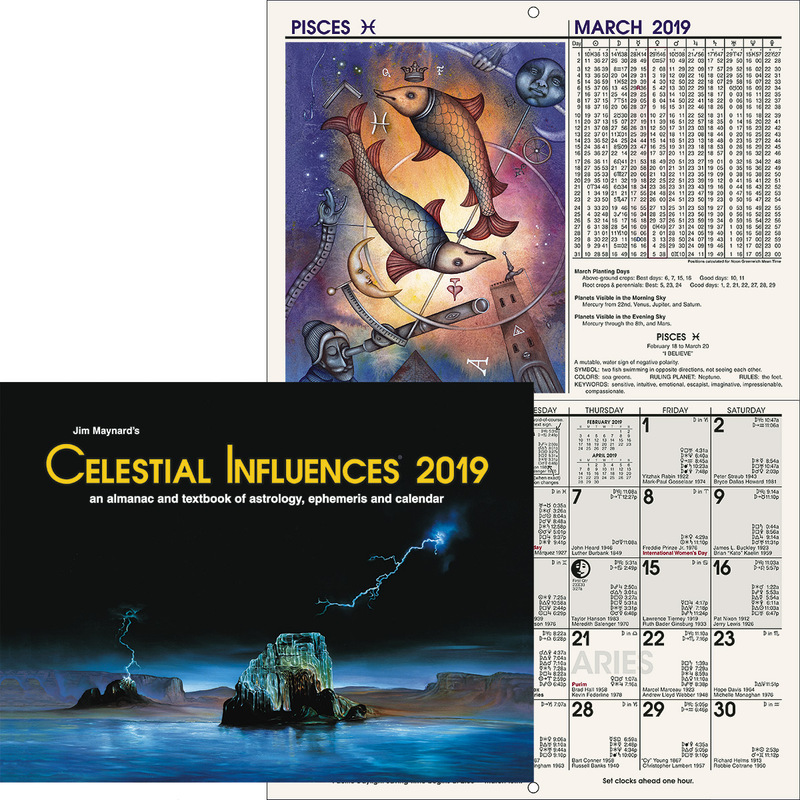 No other factors than a knowledge of the normal weather in the area, the three types of weather charts, and the customary influence of the planets, signs and aspects are necessary in astrological weather forecasting. SUN: In relation to temperature the Sun gives warmth. Its location in the fourth, and to a less degree in any angle, commonly is an influence toward warmer weather. However, if much afflicted in winter, its strong adverse aspect to the degree on the Ascendant may, if from Capricorn or Aquarius, inaugurate a cold spell. But, except under unusual circumstances, it tends toward both sunshine and warmth. Where the wind is concerned, except when it has discordant aspects from violent planets, its influence is toward calm, still weather. But in a storm chart showing great violence, if it is a member of a violent combination, it adds to the violence to be expected. That is, if it were conjunction Mercury in the fourth, and opposition Uranus and square Mars, it would signify terrific winds. 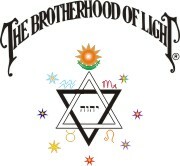 This is because of the energy it possesses which is added to the whole combination. And, because of this power and energy, when it moves to a perfect aspect to the Ascendant of the Air Movement Chart it is potent to bring whatever wind the chart shows. Otherwise its influence is toward calm weather. The Sun is distinctly a dry planet. That is, its influence is to bring dry weather and prevent rain. Because of its energy, however, when it enters into a rain configuration, especially when violently aspected, it produces lightning. In this respect it is only less powerful than Uranus. When it moves forward to a perfect aspect to the degree on the Ascendant of the Moisture Chart, because of its energy it tends to precipitate whatever rain is shown in the chart. But, of itself, it is a dry planet. MOON: In relation to temperature the Moon is cool. It does not produce the excessive cold that Saturn and Uranus does, but temperatures that are chilly and at the same time not severe enough to injure plant life. When it moves forward to a perfect aspect to the degree on the Ascendant of the Temperature Chart the influence is to produce temperature variations such as the chart as a whole indicates, rather than to give cold weather. Where wind is concerned, the Moon tends to give breezes, rather than either still weather or high winds. When it makes perfect aspects to the degree on the Ascendant of the Air Movement Chart it tends to stir up some air movement, but how much must be judged from the chart as a whole. Where rain is concerned the Moon is the wettest of all the planets. When it moves forward to perfect aspects to the degree on the Ascendant of the Moisture Chart there is a tendency to bring out whatever moisture the chart holds. The Moon, either by position or by aspect, never favors dryness. MERCURY: In relation to temperature, because moving air tends to coolness, Mercury’s influence is cold. And this influence is consistent, in spite of the fact that it ordinarily takes on the influence of such planets as it closely aspects. In a hot chart, when it moves to a perfect aspect to the Ascendant of the Temperature Chart it may inaugurate a hot spell, but this is because the chart is more powerful than the influence of Mercury. Its influence, while not toward the extreme cold of Saturn and Uranus, is always cooling. It is the chief ruler over winds, and its position in the fourth, or to a degree in any angle, influences toward wind. And when it moves forward to any aspect to the Ascendant of the Air Movement Chart, whatever wind the chart holds is let loose. It brings much more wind when measured by duration than does Uranus; but the sudden squalls which Uranus indicates may have, for a short time, a much higher velocity. Mercury tends toward dry weather, and its appearance in the fourth or in other angles tends to prevent rain, except when it is part of a combination which indicates storm. When the charts are wet and violent, Mercury adds the wind element to the storm without moderating in any degree the amount of rainfall. VENUS: In relation to temperature Venus has a moderating influence. If the previous weather was hot, she tends to cool it; if the previous weather was cold, she tends to warm things up. When she moves forward to a perfect aspect to the Ascendant of the Temperature Chart she commonly thus moderates the weather, unless the aspect is a violent one. Commonly she indicates mild and pleasant temperatures. Her influence on the wind is similar. She encourages mild movements of the atmosphere, but disparages wild movements and storms. When she moves forward to a perfect aspect to the Ascendant of the Air Movement Chart she tends to stir up some wind; but only such as the chart indicates. That is, the stimulation of the sensitive Ascendant merely loosens such wind as the chart holds. In regard to rain, next to the Moon she is consistently the wettest planet. Saturn may give floods or drought. But Venus consistently gives beneficial rains. Of course, in charts otherwise indicating storm, she indicates the rain accompaniment; but of herself she does not cause storms. Her influence is to give those rains which in the Middle West are so essential in producing crops. MARS: Mars is the hot planet, and tends more toward hot weather than any other. When he is in the fourth, or to a less extent in any angle, he commonly brings warm weather. However, if he is a member of violent and destructive combinations in the Temperature Chart, there is likely to be extremes in which hot days are followed by a sudden falling off to unusually low temperatures. When so afflicted in winter, for instance, if Mars moves forward to an aspect to the degree on the Ascendant of the Temperature Chart, instead of warm weather it may inaugurate the very opposite, and the temperature fall to a degree which causes great distress. But normally Mars indicates warmth. In relation to wind, Mars indicates some movement. He is not a windy planet, but conduces to action. 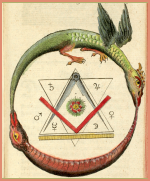 And when he takes part in a wind, by moving forward to a perfect aspect to the degree on the Ascendant of the Air Movement Chart, or as a member of a storm combination in the weather chart, he tends to cause destruction by violence. Just as you can always consider that the Moon has a wet influence, so you can always consider that Mars has a dry influence. He may, in a Moisture Chart, release rain by coming to the perfect aspect of the degree on the Ascendant, but thus he merely releases conditions that are there in spite of his protest. JUPITER: In relation to temperature, Jupiter is warm. He is not so hot as Mars, and not quite as heating as the Sun. His is a genial warmth, and this warming influence is consistent, whether due to his position in the fourth, or to his aspects to the degree on the Ascendant of the Temperature Chart. Where wind is concerned he conduces to pleasant breezes, and it is only when configured with malefic planets which strongly afflict him that he takes part in storm weather. He is not a still planet like the Sun and Neptune, but he is not violent. Because his influence is so powerful, when he is in aspect to the degree on the Ascendant of an Air Movement Chart he tends to cause winds, and may release the windy elements of the chart by such aspect. But his own influence is toward balmy breezes. Where moisture is concerned, Jupiter tends to dryness. He is neither so dry as Mars nor the Sun, but he tends to drive away gloomy clouds, and to bring fine, clear, warm weather of the kind that makes being out of doors agreeable. Even in a rather wet Moisture Chart, where some rain is shown, if Jupiter is in the fourth, or otherwise unusually prominent, those days on which rain is not shown during the period will be pleasant and cheery. But under such a Moisture Chart if, instead of Jupiter, Saturn is dominant, the days on which it does not rain will be gloomy and disagreeable. SATURN: Saturn is the storm planet. Where temperature is concerned his influence is toward cold. He is the planet which brings disastrous freezes. However, in summer, if other indications point to a drought and extreme heat, his influence when prominent will not then reduce the temperature, but will increase the extreme heat to a destructive point. In winter, his aspects to the degree on the Ascendant of the Temperature Chart may be looked for to cause a drop in temperature. And in summer also, his influence by aspect to the degree on the Ascendant means lower temperatures, of the kind which delay planting of crops, or which prevent crops growing. But in a period of extreme heat, instead of lowering the temperature, his aspect to the degree on the Ascendant causes the heat to become even more excessive and unendurable. He has a similar extreme influence on the wind. He is a still planet, tending normally toward cold, damp weather without breezes. But in a chart showing storm, or showing excessive wind, his prominence in it tends to cause the winds to reach destructive violence. In such a storm chart his aspect to the degree on the Ascendant of the Air Movement Chart releases the wind shown in the chart with unusual violence. More than any other planet, he signifies storm and destruction. Floods are usually due to the prominence of Saturn in the weather charts. He is a wet planet. The blizzards in winter in which cold and driving snow do so much damage are directly under his influence. But in a real drought period, do not look for him by position in the Moisture Chart, or by aspect to the degree on its Ascendant, to relieve the dryness. Under such conditions he adds to the grief by making it still more dry. So, while normally wet, it is best to consider him the planet most favoring destructive and disagreeable weather, whatever kind the charts as a whole and the season indicate. Because of his chilling influence, hailstorms are chiefly under his dominion. URANUS: In his effect upon temperature Uranus is rather consistently cold. But his influence is even more toward sudden temperature changes, from hot to cold and then from cold to hot. In winter or summer he tends to sudden drops of temperature. But as soon as such a drop has become effective under his influence, the temperature is apt to swing back just as abruptly to normal. In the heat of summer he may bring a thundershower which cools the atmosphere. But the heat returns as soon as the shower is over. He is decidedly a windy planet. But unlike the steady winds of Mercury, he tends to sudden gusts and squalls, which for the time are quite violent. The wind may not blow many days during the period he influences, but during certain short intervals it may reach destructive violence. In fact, where wind storms are concerned he is a violent and destructive influence. Uranus is a dry planet, in his general influence tending to dry weather. He is also the planet of lightning, and thus, while not favoring steady rain, he does favor thunderstorms in which squalls of wind and electrical displays join with temporary downpours of rain. In an otherwise wet chart he brings lightning and wind with the rain. When there is also a Saturn influence he contributes to the condition which causes hailstorms, and he is the chief influence in cloudbursts. These sudden and violent downpours in which lightning is a prominent feature are typical of his nature. NEPTUNE: Neptune is the peculiar planet in its effect upon the weather. Freak weather of all kinds come under its influence. With Mars, Jupiter and Neptune in Virgo, the sign of grain, in the summer of 1933 there was a drought in the Middle West which destroyed much grain. But on the West Coast it brought in fog from the ocean all summer long, so that it was as exceptionally cool here as it was hot in the interior. His influence over temperature ordinarily is cool but in an afflicted chart he tends to produce some kind of unusual weather which may, or may not, be cool. He is also a still planet. Normally he tends to murky conditions. But in a chart that otherwise shows storm conditions he has a violent influence which adds to the storm’s fury. When the Air Movement Chart otherwise shows violent winds, for instance, he seems to delight in sandstorms and dust storms in which visibility is clouded. In the occasional rains in which little fish or little frogs or mud comes down with the water, he always plays an active part. And in tornado and hurricane charts, his presence in the fourth, or his heavy aspect to the Ascendant, not only increases the violence of the storm, but brings unusual phenomena. I have already mentioned how rains of unusual nature are influenced by him. Normally, however, he does not favor rain, but tends to mists and fogs. Hazes and smoky conditions and all such impediments to visibility are chiefly due to his influence. In a wet chart his influence tends to increase the amount of rain, and in a storm chart it increases both the amount of water and the violence of the storm. He, more than any other planet, brings about peculiar weather conditions. PLUTO: In his influence upon temperature Pluto is cool. In this respect his influence is about that of the Moon and Neptune rather than the extreme cold brought by Saturn and Uranus. Pluto, however, is decidedly a violent planet, and his prominence in a weather chart, or his aspect to the degree on the Ascendant, tends to bring extreme conditions. But, unless the chart as a whole shows much heat, his influence tends uniformly to cold. Only in a drought chart, or a chart otherwise showing violent heat, does his influence add to the destructiveness of the heat rather than tend to cool weather. In his influence on the air he tends to produce wind; and when he is prominent and violently aspected in the Air Movement Chart, he brings winds of a violent and destructive nature. He is not quite so sudden and abrupt as Uranus, but his destructive influence under severe affliction is even more far reaching and enduring. But when he is well aspected, instead of producing violent winds and disagreeable weather, he brings invigorating cool breezes that are decidedly beneficial. In his influence on rain he is a moist planet. His typical influence is not to bring fog, like Neptune, nor heavy rain like the Moon, but just a steady drizzle. These light, steady rains, when he is well aspected, are beneficial to crops. Afflicted, and with Saturn prominent in winter, they may become sleet. But when Pluto is heavily afflicted in a storm chart, such as receiving the square of Uranus, he is next to Saturn in his ability to produce storms of death and destruction. He is decidedly a violent planet, and lends this violence to the added fury of such charts as indicate cloudbursts, tornadoes and hurricanes. ARIES: The sign Aries in its influence on temperature is hot. Scorpio, the other Mars sign, gives extreme weather conditions which usually are hot but which may tend to extreme cold. Scorpio has the co-rulership of the planet Pluto, which may account for this. The other hot sign is Leo. These two signs, in so far as the Temperature Chart and temperature influences are concerned are the signs of high temperatures. Because Mars and Aries are both so restless and active we need not be surprised that this movable sign gives some wind. We may consider it only fairly windy, however, in comparison with Gemini, Virgo, Libra and Capricorn, which are more windy, and in comparison with those signs which are calm. Of all the zodiacal signs Aries and Leo are the most dry. When, however, Aries is prominent in a chart that shows much rain, as when the Moon is in the fourth or the first in Aries, it brings violence along with the rain. But when it is prominent in a dry chart in summer it brings dry, hot winds which tend to desiccate the vegetation and scorch the leaves of growing crops. TAURUS: In its influence upon temperature Taurus, like its ruling planet Venus, has a moderating influence. If the preceding weather has been unusually cold, the influence of Taurus is to warm things up. But if the preceding weather has been extremely hot, the influence of Taurus is to bring cooler temperatures. Its general influence is toward those temperatures which are best for growing crops, during the times crops are in the field, and toward those temperatures which favor domestic stock at other times of the year. It may thus be said to be, more than any other sign, the farmer’s friend. Taurus is a fixed sign, the most fixed of all the signs. And this stabilizing influence marks its effect in an Air Movement Chart. More than any other sign Taurus tends to calm weather in which not a breath of air stirs. Therefore, in so far as this sign is dominant in an Air Movement Chart, it tends to prevent winds. Just as its opposite sign, Scorpio, tends to produce extreme weather conditions, so Taurus tends to produce moderate weather and a still atmosphere. In conformity to the fact that the Moon, wettest of all planets, has its exaltation there, Taurus tends toward wet weather. But this wet weather is not of the nature indicated by Capricorn, for instance, in which cold rains delay the planting and growing of crops. The typically Taurus weather gives what the farmer calls growing rains. They are not floods, but of generous quantity that benefit crops. Steady rain for a day or two, just enough falling that it has time to soak into the ground, and does not run off so quickly as the more copious downpours of Cancer. GEMINI: Gemini is a cold and drafty sign. Its influence in the Temperature Chart may be considered as favoring cold weather. However, it may also be considered to favor rapid changes and variable temperatures. It does not give extreme cold as do Capricorn and Aquarius, but tends to real cold rather than the cool weather of Pisces. But in addition to the cold, when it has influence, look for fluctuations in temperature. No other sign is as windy as Gemini, although Virgo makes a close approximation to it. Libra is windy, but not as windy as Gemini and Virgo. In so far as this sign has influence in the season Temperature Chart and Air Movement chart you may expect lively winds without surcease. And in weather charts which indicate storm, it shows that wind will be an accompaniment. Gemini is bone dry, even though cold. It does not favor rain, and even tends to blow fog and mist away. Even the clouds in the sky are driven from view by its winds of variable power. Only when the rest of a weather chart shows rain does it play any part with precipitation. Then it indicates that it will be a driving rain, or rain which is part of a wind storm. CANCER: Cancer is also a cold sign, but not drafty. Nor is the cold so intense as that given by Capricorn and Aquarius. It is colder than Pisces, however, and the coldness frequently is accompanied by rain in summer and snow in winter. In so far as it has influence on the Temperature Chart it tends to give low temperatures. Although Cancer is ruled by the Moon, which tends to restlessness and breezes, its influence is toward quietness. It is the only one of the movable signs having such an influence, as Aries gives some wind, Libra is windy, and Capricorn gives wind and storm. The stillness is not so pronounced as that of Taurus and Leo, but enough so that it can be considered as a sign tending toward calm weather. Of all the signs, Cancer is the wettest, although Scorpio, because of its extreme tendencies may, at times, give more violence to the downpours. Cancer, in its effect upon the Moisture Chart, and to the extent its influence becomes dominant, tends to steady and voluminous rains. It does not bring the cloudbursts, nor the sudden squalls; neither does it bring drizzles, nor just a few rainy hours. When it has power, it brings the kind of weather when it rains and rains some more, the water coming down in full force for days at a time. LEO: Leo is a decidedly hot sign. Dry and hot. Under its temperature influence often not a breath of air stirs. The rays of the Sun bear down with a heavy hand, and the land swelters. Even in winter time, in so far as this sign has dominance of the Temperature Chart, warm weather may be expected; those bright, sunshiny days that tend to melt the snow and drive the snow clouds from the sky. Next to Taurus it is the stillest sign of all. In so far as it has power to do so it stifles wind. Thus it is a fine influence in winter, warming the atmosphere and quieting the breezes. But in spring it may, when it is the dominant influence in the Temperature Chart, bring such fine warm days that the buds and blossoms of fruit may open prematurely, and the sap start running; to be followed, under some cold aspect to the Ascendant of the Temperature Chart, by a freeze which destroys the crop for that year. And it is dry, along with Aries tending to parch the earth. Uniformly, its prominence in a moisture chart tends to delay rain and to prevent cloudy weather. Bright, clear, sunshiny days are typical of its influence. Yet it does have an influence when associated with storms. Next to Aquarius it is the most electrical sign. When, consequently, there is a storm and the planets indicating it are in Leo, or the wet conditions are so pronounced as to bring rain in spite of Leo’s prominence in the chart, lightning and other violence may be expected. VIRGO: Virgo, while not as cold as Capricorn and Aquarius, is nevertheless a cold sign. And the winds it causes are cold winds. In so far as it has influence over the temperature, either in winter or summer, it tends to cold, dry, windy weather. Blustery weather is typical. Its influence on the Air Movement Chart is uniformly in the direction of wind. These winds are variable, both as to force and direction; but not so changeable as those of Gemini; for under Gemini it may blow a gale from one direction, and in an hour change around and blow a gale from exactly the opposite direction. Cutting winds, such as penetrate clothing and chill one to the bone, are quite characteristic. It is also uniformly dry. It tends to discourage wind and fog; but when the wet influences are strong enough to override this tendency, it adds wind to the storm. LIBRA: Libra cannot be classified as cold, in the same sense that Capricorn and Aquarius, or even Virgo and Cancer, are cold. It is more correct to say that its influence is cool; a milder influence than those mentioned, but in the direction of lower temperatures rather than heat. That it is an airy sign, and a movable sign, is fully born out by its influence in producing wind. It does not just produce breezes, but those stronger air currents which are commonly called wind. In this respect it is not so pronounced in its influences as Gemini and Virgo, but nevertheless it contributes markedly to the wind tendencies in any chart in which it is unusually prominent. Even though it is a Venus sign, it contributes to, rather than detracts from, the wind tendency of a storm chart, and may be one element in a tornado or hurricane. When the chart is not otherwise violent, the wind it brings is cool and refreshing, and not cutting and disagreeable like Virgo wind. On moisture it has a drying influence. Uniformly, in the Moisture Chart its influence should be read, in so far as it is dominant, as favoring dry weather. It tends to drive the clouds from the sky and to give bright sunshiny days which, except for considerable wind, are enjoyable and favorable for outdoor work. SCORPIO: Of this sign it may be said that it, more than any other, tends to extremes. Possibly this may be due to the corulership of the sign by Pluto, which is a planet of extremes, being exceedingly constructive or excessively destructive. In so far as Scorpio has dominion in a weather chart, there is either pronounced cold or extreme heat. Its influence seems never to be toward moderate temperature. In regard to its influence over the Air Movement Chart, however, its dominance, if the chart as a whole shows violence, is always to increase the violence shown. If the chart shows wind, Scorpio inclines the wind to be destructive in force. If the chart does not show wind, but heat, it gives still, sultry days, in which the humidity and oppressiveness carrying into the night, making sleep difficult or impossible. Its power is often felt in storm charts which give rise to winds which reach the proportions of tornadoes and hurricanes. Scorpio is a wet sign, but not one which will break a drought. In weather charts which otherwise indicate dry weather, a dominant Scorpio merely makes the lack of rain continue and the dryness more extreme. But in a rain chart, or a storm chart showing rain, its influence is toward extreme precipitation. Thus it frequently is a noticeable influence in the cloudbursts of our western mountains and in the terrific downpours that sometimes accompany the more violent storms of the East and Midwest. SAGITTARIUS: Sagittarius, in its influence over temperature, is not hot like Aries and Leo, but is decidedly warm. In so far as it is a prominent factor in the Temperature Chart the weather to be expected is bright, clear, sunshiny and warm. It favors neither clouds nor fog, but tends to make visibility exceptionally good. The wind it brings is of moderate force and has an invigorating quality. Although giving some air movement, it neither favors nor discourages storm winds to any appreciable extent. It is a dry sign, and tends to dissipate clouds and prevent rain. To sum its general and consistent influence up, it tends to fine, pleasant weather, such as favors outdoor work and outdoor sports. CAPRICORN: This is the sign of storms, of extreme cold, and of destructive floods and droughts. Its influence commonly is toward low temperatures, and in winter to temperatures so low as to be destructive of life. But in a period of excessive summer heat, do not look for Capricorn to moderate it. Instead, it will make the heat even more disagreeable. It is the sign which, more than any other, brings blizzards. It increases the wind force when dominant in an Air Movement Chart. When the temperature drops to below zero, and the wind rises to a gale, driving sleet and snow before it, is typical Capricorn weather. And, at any time of year, when storm is indicated of any kind in a chart, such influence as it has is toward increasing the destructiveness. It is the detriment of the Moon, and is not only a wet sign, but tends toward floods and destructive snowstorms and hailstorms. In a drought period, however, it cannot be counted on to bring rain. It just tends to increase the drought. And in so far as it is dominant it brings disagreeable conditions, such as dark, damp, cold days, and cold drenching rains when rains are not needed. Unseasonable weather of all kinds come under its rule. AQUARIUS: Next to Capricorn this is the coldest sign, and a drop of temperature may consistently be expected under its influence. Dry, crisp, cold weather, such as often occurs in February is typical of its influence. Only when other influences are violent does it participate in storm, but when such conditions exist, it tends to increase the fury of a blizzard. Although it is a fixed sign, it tends to some movement of the air. Moderate breezes are characteristic of it, except when the chart is a violent one otherwise in which case, as mentioned, it makes for excessive cold and driving wind that drifts the snow in blinding clouds. It consistently favors dry weather; but when the other parts of the Moisture Chart and Temperature Chart indicate rain, it adds to them the electrical element. Of all the signs, it tends most to give lightning. Whenever, therefore, in a chart for a region where lightning occurs, this sign is prominent in a rain chart, look for electrical pyrotechnics. PISCES: Pisces is not so pronounced in its influence as to be called cold, but is rather cool. Its influence in the Temperature Chart is consistently toward somewhat lower temperatures, but not of an extreme nature. As might be gleaned from the fact that it is the exaltation of Venus, its influence in general is not violent, but mild. Where the Air Movement Chart is concerned, it tends toward calm weather. In this respect it is not so powerful as Taurus and Leo but, nevertheless, it tends to moderate whatever windy influences are present. It is consistently a wet sign, but not given to the downpours that Cancer occasions, nor to the floods and disagreeable storms indicated by Capricorn. In a chart which shows storms, if prominent, it merely indicates that much rain will accompany the violence shown. But when free from extreme influences, it causes those rains which are seasonable and of marked benefit to the crops. In all its weather influences, next to Taurus, Pisces is most moderate, and produces conditions favorable to crops and to livestock. It also, therefore, like Taurus, only in a less degree, is the farmer’s friend. But do not plan a picnic when its influence is dominant; for the rain it brings is sufficient to discourage outdoor pleasures. 11:58 P.M. LMT; 118:15W. 34N. Of the four planets in the fourth, Mars indicates some air movement, and Mercury wind. Sagittarius on cusp of fourth gives some movement, but Leo, the sign occupied by Jupiter, its ruler, is calm. Virgo, on Asc. is windy, and its ruler, Mercury, is in windy Capricorn. Saturn, ruling sign Mercury is in, is in windy Capricorn. Of the planets in angles—Mercury, Moon, Uranus and Pluto—all give wind. 4:47 A.M. LMT; 118:15W. 34N. Uranus in fourth is windy, and Moon in fourth breezy. Aries on fourth cusp gives some wind, and the sign occupied by Mars, its ruler, is windy Capricorn. Mercury in first gives wind, and Sagittarius on Asc. some air movement, while the sign occupied by Jupiter, ruling Sagittarius, is calm Leo. Of planets in angles—Mercury, Moon, Uranus and Pluto—all give wind. 6:34 P.M. LMT; 118:15W. 34N. Of the rulers of the fourth, Mars is in Aquarius and Pluto in Cancer, neither windy signs. Neptune in the first is a calm planet, and Leo on the Asc. is calm. The Sun, ruler of Asc., is in not-windy Aquarius. Uranus, ruling sign Mercury occupies, is in windy Aries. Of the planets in angles, neither Neptune nor Venus gives wind.